Project Status | UMN Pharma Inc.
UMN Pharma Inc. has been aiming to contribute to the health of people through creating next-generation logical vaccine based on our own technology platform that is possible to expand worldwide in order to fulfill the needs of unmet medical area. Through capital and business alliance with Shionogi & CO., LTD., signed on October 31, 2017, we have been promoting development of core technology related to drug discovery, and have been developing a part of our existing in-house developed pipelines utilizing this core technology, and fundamental research on development candidates which are composed of new development targets as well. In terms of fundamental research on developed products, we have been working on creation of next-generation logical vaccine, integrating production technology of recombinant protein antigens, adjuvant technology, and formation/drug delivery technology. We have been aiming at the next-generation logical vaccine; which is our development concept of vaccine, integrating manufacturing technology of recombinant protein antigens to be a drug substance for next-generation biopharmaceuticals including human vaccine for infectious disease prevention, adjuvant technology and formation drug delivery technology; utilizing our various knowledge, know-how, regarding biopharmaceutical technology platforms developed for over 10 years. We have been aiming to realize optimal high effectiveness and high productivity against target infectious diseases by next-generation logical vaccine. In other words, it becomes possible to realize high effectiveness by inducing optimal immunity against each target infectious disease, utilizing formation/ drug delivery technology. 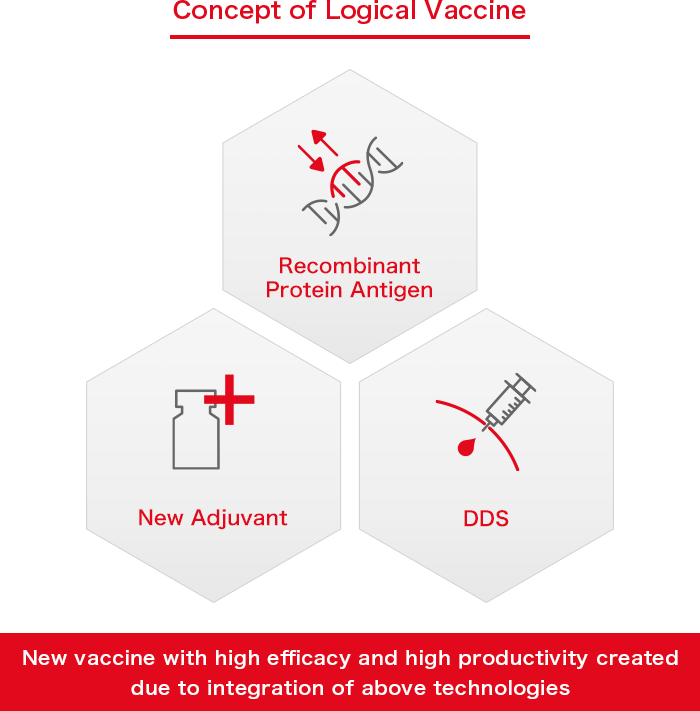 In addition, not only it becomes possible to realize high effectiveness with less amount of antigen by utilizing adjuvant technology; but also it becomes possible to secure a supply amount to cover the market by using our current production systems and to contribute to cost reduction, due to technology to effectively produce recombinant protein antigens. We have been promoting research and development regarding on the following in-house development pipelines. In addition, we have been promoting fundamental research not only for these in-house development pipelines, but also for next-generation logical vaccine candidates. All of the in-house developed pipelines are at the basic research stage; however, we have been accelerating R&D activities through alliance with a business partner. (Note)The following development codes are given at the basic research stage. Regarding pipelines which will be shifted to the full development stage after the non-clinical trial stage, new development codes will be added. UMN-101 is a generally seasonal influenza vaccine which is vaccinated every season in winter. Currently, we have given a new development code, UMN-101, and have been pursuing research and development with our proprietary technology based on our next-generation logical vaccine concept as mentioned above. There are three types of influenza virus A, B and C; and especially, type A and type B are prevention targets by vaccine, since they are strongly infectious and easy to spread. 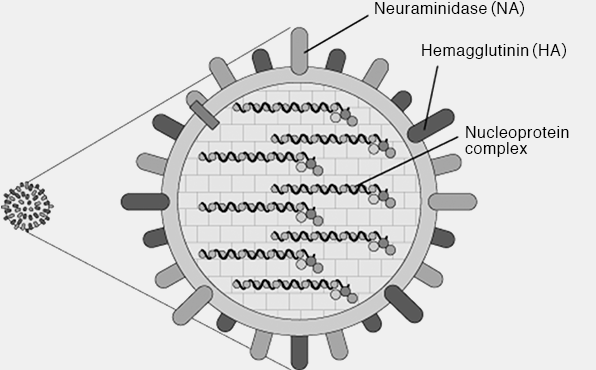 Two glycoproteins, HA (hemagglutinin) and NA (neuraminidase), are present on the surface of these virus particles. HA is protein that functions when influenza viruses enter cells, and NA is protein that works when propagated viruses in cells exit out of the cells. These are regarded as target antigens for protective immunity against infection. In terms of type A, there are at least 16 kinds of HA, and virus types are determined by combining with 9 kinds of NA. For example, H1N1 influenza virus consists of a combination of the first subtype of HA and the first subtype of NA. UMN-102 is a prophylactic vaccine against avian influenza virus (H5N1, H7N9, H9N2 subtype etc., highly pathogenic viruses are also included) which has been pointed out the danger of world epidemics in recent years and must be responded early at world level, that is, UMN-102 is a novel influenza vaccine. Currently, we have added a new development code, UMN-102, and have been developing it independently based on the above our next-generation logical vaccine concept. The most characteristic property of the influenza virus is to cause variation almost every year, and effects of the vaccine have changed almost every year depending on its extent. Also, depending on mutation, a worldwide epidemic often occurs. This epidemic is generally called a “pandemic”. It is a memorable experience that the pandemic of influenza A (H1N1) occurred in 2009. Recently, the highly pathogenic avian influenza virus, including H5N1, has emerged, and many cases of infection death of migratory birds and the spread to house chickens have been reported. It has been pointed out danger of causing a high mortality pandemic, which may become infected not only from birds to humans beyond species, but also eventually between humans. If a pandemic occurs in modern times where transportation has developed, infection may not be limited to particular area, and the number of infected people may increase extremely for a short term and extensively. Therefore, it is important to prevent a spread of infection by short-term production of vaccine adapted to the epidemic influenza virus subtype and by inoculation to as many people as possible. UMN-102 is a recombinant influenza vaccine against such a pandemic. UMN-103 is a simple vaccine containing recombinant protein of VP6 obtained from rotavirus of group A. Currently, we have added a new development code, UMN-103, and have been promoting research and development with our proprietary technology based on our next-generation logical vaccine concept as mentioned above. Rotavirus particles are covered with three layers of capsid (shell) protein, and the group (Group A to Group G) is determined by protein VP6 constituting intermediate capsid. Since group A is the most common as a pathogen of human rotavirus infection, UMN-103 is based on a vaccine antigen of VP6 recombinant protein gained from rotavirus of group A. Every year, because of rotavirus, it is said that about 450,000 people have lost their lives in the world. (Emerg Infect Dis. 2008；Vaccine 2012) Although live vaccine against rotavirus which are commercially available can be vaccinated in many countries, since a concern of side reactions inducing intussusception disease cannot have been dispelled, development of high safe vaccine has been strongly expected instead of live vaccine. UMN-104 is a multivalent vaccine from ingredients of Virus Like Particle (VLP) of norovirus 2 genotype, which we have been developing under licensed to non-exclusive commercialization rights worldwide from Timo Vesikari, M.D. and Vesna Blazevic, Ph.D. of the University of Tampere, Vaccine Research Center of Finland. Currently, we have added a new development code, UMN-104, and have been promoting research and development with our proprietary technology based on the above our next-generation logical vaccine concept. It is said that norovirus is greatly classified into two groups (GI, GII) by homology of viral gene sequences, and GI is further divided into 15 genotypes, GI.1 to GI.15, and GII is further divided into 20 genotypes, GII.1 to GII.20. UMN-104 has been designed to exert effectiveness against multiple genotypes of norovirus, and has contained VLPs of multiple antigens. Norovirus is a major causative virus of viral gastroenteritis, and it is said that approximately 200,000 people’s lives have been lost by norovirus worldwide every year (Emerg Infect Dis. 2008；Vaccine 2012). Although there are few cases of death in development countries, since medical economic loss is enormous, prevention with vaccine has been expected; however, there has not been vaccine commercially available yet against norovirus, so with UMN-104, prevention against viral gastroenteritis caused by norovirus has been expected. (Note)VLP (Virus Like Particle): A hollow virus-like particle that has only outer shell of virus and does not have virus genome inside. Since it does not have the viral genome, although it cannot grow within the host, it can induce antibody production against outer shell. VLP is much bigger than single particle of recombinant protein, and since it is easy to be phagocytosed like pathogens by antigen-presenting cells such as dendritic cells and macrophage etc., it has been expected to introduce strong immunity without adjuvant as an antigen. (Note)The above development codes are given at the fundamental research stage, and new development codes will be added to pipelines that will be shifted to the full development stage after non-clinical trial stage.